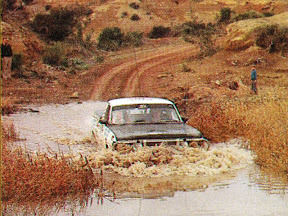 Details of entrants are taken from the official results and from the Challenge Australia book, with most photos from that book and courtesy of Ray Berghouse, Chevron Publishing. Car number 1-50, 51-100, 101-150, 151-208 below. 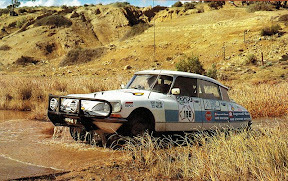 The ageing Peugeot 203 placed 69th on the seeding stage but had problems near Ballarat, missing a couple of controls. Despite skipping the Sunset Country, they completed the remainder of the division to be only 2 controls down at Adelaide. A late departure from Adelaide and generally slow times saw them cut and run from Kingoonya to Perth, missing 14 controls. They made good progress through WA until losing more than an hour near Wittenoom, and then an hour and a half in the sand before Port Hedland where they retired, out of late time. Atter placing 116th on the seeding stage, the Torona struck problems on the first night skipping the Heywood special stage and the two stages after Mt Gambier. They continue through to Adeliade with 4 controls missed. They lost more than an hour on the run from Broken Hill to Frome Downs and then skipped from Blinman to Nullarbour Roadhouse. They also skipped the stages through Rawlinna but went to the end control at Karonie, so only missing 6 controls on the division to Perth. 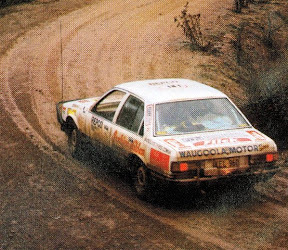 After a late departure they did much of the WA division but skipped the stages before Newman and the Nunyerry Horror Stage but only dropped one more control to Darwin. A solid run from Darwin saw them miss no further controls, placing 17th on the division to Townsville, 33rd on the division to Sydney and 52nd on the final division. They were categorised as finishing 28th with 10 (or 11) controls missed. A 94th place on the seeding stage was followed by a reasonable run as far as the Bordertown big where they lost 2 hours. The results show then 52nd at Adelaide but they may have been further down. Their progress through SA is not rcorded and they apparently retired at Kingoonya with unspecified problems. Their 62nd place on the seeding stage suggested that this crew should have been further up the field. Despite taking the one hour maximum on the Sunset Coutnry they placed 49th into Adelaide. A good run through the Flinders Ranges saw them climb a few placed but over an hour lost at Maree cost them dearly. They had further problems at Kingoonya and had to cut and run to Perth dropping 13 controls. On the WA division they skipped all the competition from Meekatharra to Port Hedland, dropping 6 controls, but then completed the route to Darwin. A late departure saw them miss the first stage out of Darwin but then they completed the remainder of the division to Townsville with only the one control missed. Problems at Mackay saw them miss another control but they otherwise had a good run down to Sydney. They placed 21st on the final division and we classified 36th overall with 21 controls missed. A slow run on the seeding stage (125th) was followed by a reasonable run through to Mt Gambier. 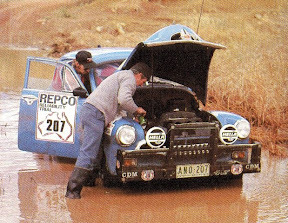 Then the Beetle got stuck on the next boggy section for an hour and more time was lost on the Tarpeena stage. They perhaps then got stuck in the Bordertown bog but did not emerge withing late time and headed for Adelaide missing 9 controls. They apparently did not start the next division and may have been out of late time at Adelaide. Problems on the seeding stage saw this apparently inexperienced crew lose one and a half hours placing them pretty much last. They perhaps wisely headed straight for Adelaide missing 18 controls. The second division didn't start much better with over an hour lost on each of the first stages. They reportedly retired at Broken Hill out of late time. This Melbourne based crew were one of the first retirements when their gearbox failed at Tooborac. The service crew reportedly sabotaged the car when the relatively inexperienced crew were "going to kill each other"! They apparently put gravel in the bell housing that created one hell of a racket and locked up the starter motor when they thought they had stalled it and tried to restart it. One of several large P76s in the event, they placed 99th on the seeding stage and had a solid run through the first night. 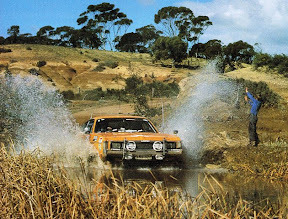 They struck trouble in the Sunset Country and had to short cut, and then also short cut the stage to Murray Bridge but placed 78th into Adelaide with no controls missed. A late departure from Adeliade saw them head directly to Broken Hill where they rejoined the competition. They must have got stuck in the sand enroute to Immarna, losing over 3 hours, and then never made it to Nullarbor Roadhouse within their late time. They skipped to Perth missing 16 controls for the division. After Perth they skipped the stage to Cervantes and the stages before Newman, then bypassed the Nunyerry stage, but did the remainder and only missed 2 controls on the division to Darwin. They missed all the competition to Mt Isa but did the remainder of the division to Townsville missing 6 more controls. A late departure from Townsville and more problems at Rockhampton meant they eventually had to skip from Dorrigo to Sydney. They finished the final division in 40th and were classified 42nd overall with 27 controls missed. A slow start (103rd on the seeding stage) was followed by similarly slow time through to the Bordertown bog where they must have become stuck or at least they skipped two controls. They completed the division to Adelaide but may have short cut the Sunset Country. 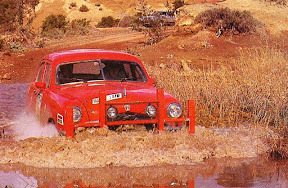 After a late departure from Adelaide they hit a gate post on the first trial stage and skipped to Broken Hill missing 3 more controls. Their problems continued as they skipped from Blinman to Nullarbor Roadhouse but completed the remainder of the division to Perth with 8 more controls missed. After Perth their fortunes improved and they compleetd the entire division to Darwin in 25th place despite more than an hour lost in Port Hedland. Apart from skipping the Roper Bar stage they completed the entire division to Townsville with no controls missed and in 23rd place. They were 28th on the division to Sydney and 46th on the final disivion. They were classified 21st outright with 6 controls missed (but perhaps should be 10). The Melbourne based Galant crew placed 66th on the seeding stage and climbed to 47th by Mt Gambier. Despite losing over an horu on the Bordertown bog, they were 43rd at Renmark and up to 40th into Adelaide. They had a good run through SA and despite losing more than an horu in the sand to Immarna they were up to 35th. 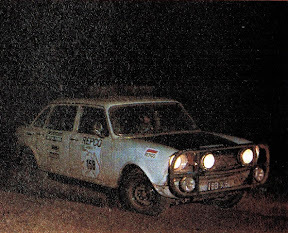 The good run came to en end, presumably with punctures, with considerable tiome lost into the Nullarbor Roadhouse and on the subsequent stage, after which they headed for Perth missing 10 controls. They retired there, perhaps out of late running time. 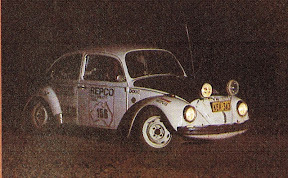 The famous 1968 Marathon winning car placed 131st on the seeding stage with similarly slow times through to the Bordertown bog where they took a maximum and then skipped to Kuitpo, but had problems losing almost another hour. The 6 controls missed into Adelaide soon became more as they skipped to Kingoonya, missing another 10, apparently went to Immarna but never made it to the Nullabor Roadhouse within late time. By Perth they had missed 23 controls for the division and apparently retired, out of late running time. No details are recorded for this entry which clearly never made it to Adelaide, but how far they went is anyone's guess. The picture certainly suggests that they competed at Tooborac! After a slow start (96th on the seeding stage), the VW made good progress through the first nigth with minimal time loss in the Bordertown bog. 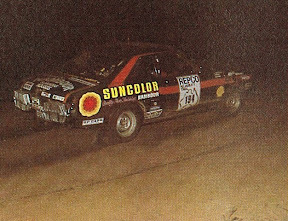 Despite a one hour maximum on the Sunset Country, they placed 48th into Adelaide with no controls missed. Their progress through SA is not recorded and they retired somewhere on the division to Perth. Problems on the seeding stage (140th) saw them well down the field so that they lost a lot of time in the two boggy trial stages after Mt Gambier. After being stuck in the Bordertown bog they headed for Adelaide missing 6 controls. Large time losses ensure on the stages up to Broken Hill from where they essentially cut and ran to Perth, missing 19 more controls. 56th, 38 controls missed. 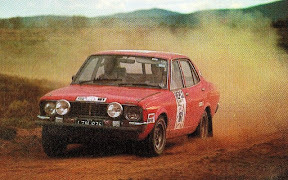 After a late departure from Perth they eventually skipped the stages from Newman to Port Hedland and the subsequent stage, dropping 6 controls on the division to Darwin. They skipped from Darwin to Mt Isa then from Cairns directly to Townsville dropping another 7 controls. After a reasonable run donw the east coast they skipped the final competitive near Kempsey but did the entire final division on which they placed 47th. They were classified 56th with 38 controls missed. 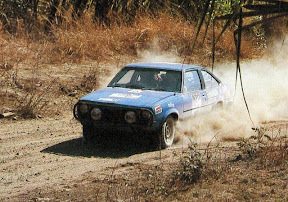 After placing 112th on the seeding stage, the SA Torana crew made good progress until losing close to 2 hours on the Tarpeena stage, but scraped through the Bordertown bog with minimal loss. They placed 58th into Adelaide with no controls missed. Probelms were encounted on the run up to Broken Hill where they retired. 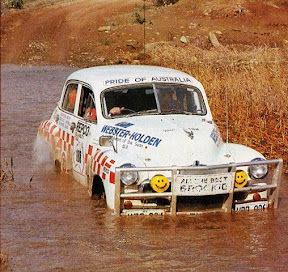 The old Ford was 135th on the seeding stage but after the next special stage they struck trouble and headed for Adelaide. After Adelaide they completed the first trial stage but then headed directly for Perth. The rejoined the competition at Geraldton but again, after one competitive stage headed for Darwin where they retired, out of late time. A slow start (137th on the seeding stage) was followed by slow times through to Bordertown where they took a maximum. They perservered, but skipped the Sunset Country. They struck problems at Kuitpo losing almost an hour but made it into Adelaide with only 2 controls missed. 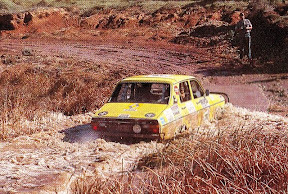 After losing more than an hour on each of the two trial stages in the Flinders Ranges they shorty cut from Curnamona to Frome Downs missing 3 controls. They lost over 3 hours in the sand to Immarna then never made it to the Nullarabor Roadhouse within late time. They headed for Perth missing 9 more controls. On the run to Drawin they skipped the stages after Meekatharra and basically followed the highway afetr Port Hedland, dropping 4 more controls. Another 4 controls were missed on the division to Townsville as they shortcut from Katherine to Mt Isa and also skipped the Norman River stage. They only did 3 stages on the division to Sydney, missing 10 more controls. They placed 54th on the final division afetr skipping the Tulluch Ard stage. They were classified 46th outirght with 31 controls missed. After placing 11th on the seeding stage the 2 man Porsche crew had a reasonable run until the Bordertown bog which they did not escape within their late time limit. They skipped to Kuitpo and into Adelaide with 6 controls missed. They struck major problems on the first Flinders Ranges stage and eventually rejoined at Coolgardie, missing 17 controls into Perth. To be completed. 52nd with 33 controls missed. After a late departure from Perth they persevered through the entire route to Port Hedland but then had to head for Darwin direct to make it within late time. AFter the first stage out of Darwin they skipped to Mt Isa, then subsequently skipped the Norman River stage, missing 5 more controls into Townsville. 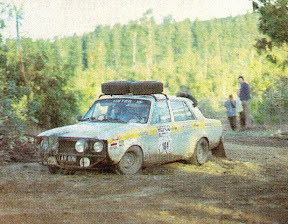 They struck problems at Mackay and skipped the stages to Rockhampton but then completed the remainder of the division to Sydney. A goo run on the final division placed them 25th and overall they were 52nd outright with 33 controls missed. The two man WA crew in the 16TS placed 118th on the seeding stage then had areasonable run before losing an hour and a half on the Tarpeena stage. They managed to get through the Bordertown bog with minimal time loss but problems them forced them to mostly short cut to Adelaide missing 3 controls. Their progress through SA is not recored but they certainly retired somewhere on the division to Perth. The all girl crew in the Kambrook "whistler" Commodore placed 109th on the seeding stage then had a reasonable run until losing over an hour on the Tarpeena stage. Having escaped the Bordertown big relatively unscathed, they nevertheless skipped the Sunset Country but did not drop a control in Adelaide where they were placed 69th. Their progress after Adeliade is not recorded but they reportedly blew the clutch somewhere, perhaps in the sand on the way to Immarna. Another story suggests they then made it to the Nullarbor Roadhouse but they retired because Lillie was ill. The results suggest that this crew did not complete the seeding stage and that they rejoined competition at Renmark, completing the run into Adelaide with 13 controls missed. Things didn't improve after Adelaide with problems at Yunta from where they headed for the Nullarbor Roadhouse, skipepd the Rawlinna stages and headed into Perth with a further 11 controls missed. While they completed the stages to Geraldton they appeared to then cut and run to Newman, did the 3 stages to Port Hedland and then followed the highway to Darwin with 5 more controls missed. They only did the first stage out of Darwin and missed 14 more controls to Townsville. 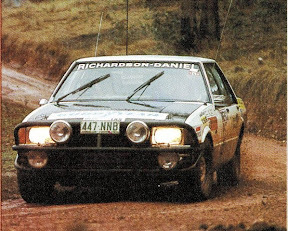 They picked up a handful of stages on the run to Sydney missing another 8 controls then only did the Canberra and Beechworth stages on the final division. They finished 74th with 59 controls missed. After losing half an hour on the seeding stage (148th) this crew from central Victoria battled through the mud losing several hours before taking a maximum at Bordertown and heading for Adelaide with 8 controls missed. They presumably left Adelaide late and headed straight for Broken Hill, did the 3 stages to Marree then cut to Perth missing 20 controls for the division. On the WA division they skipped the stages from Meekatharra to Newman and the stages before and after Port Heldnad, but only dropped 3 controls into Darwin. On the run to tTownsville they skipped from Katherine to Mt Isa, skipped the Norman River stage and went directly south from Cairns, missing a further 9 controls. 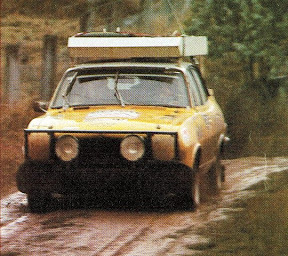 After doing the route siuth to Brisbane they missed much of the overnight stages to Sydney missing 7 more controls. They only did the Canberra and Beechworth stages on the final division buy were classified as finishing 71st with 56 controls missed. The Sydney based 504 hit a tree on the seeding stage and after effecting repairs they headed directly for Adelaide with 18 controls missed. 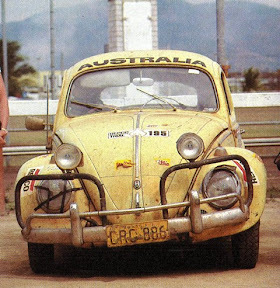 Things didn't improve after Adelaide and they eventually rejoined the competition at Nullarbor Roadhouse, but skipped the Rawlinna stages after bending the chassis and front suspension. They completed the remainder of the route to Perth with 15 more controls missed. On the WA division they appear to have only done the Rabbit Run stage, the stage into Port Hedland and the Kimberley stage, but only missed 4 more controls into Darwin. From Darwin they headed for Mt Isa, did one stage, then headed for Cairns and did the stage south, missing 8 more controls on the division to Townsville. They did the route south to Brisbane but then cut and ran to Sydney missing 10 more controls. On the final division they only did the Beechworth stage but were classified 80th with 69 controls missed. After placing 123rd on the seeding stage this cenhtral NSW crew had areasonable run until losing more than an hour and a half on the Tarpeena stage. However they then negotiated the Bordertown bog relatively unscathed but struck problems on the Sunset Country and eventually headed for Adelaide missing 3 controls. They lost more than an hour on the first Flinders Ranges stage and then cut and ran from Yunta to Perth missing 23 controls. After a late depature from Perth they completed the route to Newman, skipped to Port Hedland and then completed the remainder to Darwin missing 4 controls for the division. 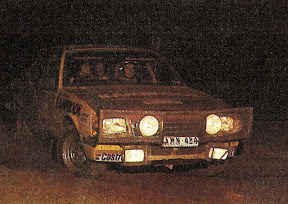 From Darwin they headed straight to Mt Isa but lost over 2 hours on the Kajabbi stage then headed for Cairns and on to Townsville on highway, missing a further 12 controls for the division. AFter following the rouyte to Brisbane they followed the highway to Sydney missing 9c ontrols. They only did the Canberra and Beechworth stages on the final division and were placed 77th outright with 60 controls missed. 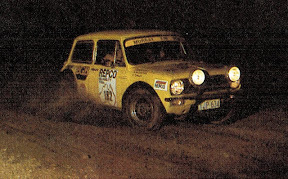 The cramped 3 man crew in the Mini placed 97th on the seeding stage and climbed to 80th by Mt Gambier. Soon after they broke a transmission, changed it on the roadside (which is difficult in a Mini!) only to find a tooth still in there so they went to Mildura to change the engine and head directly to Adelaide, but then the gear box failed again so they had to replace it again in Adelaide, having missed 10 controls. 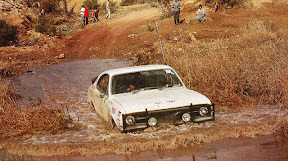 They eventually caught up with the rally again at Broken Hill, missing another 4 controls. More problems struck enroute to Blinman from where they eventually headed for Perth having missed 21 controls for the division. They retired somewhere after Perth but no details are recorded. 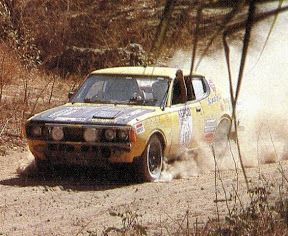 The ex-works Falcon entered by the Alice Springs based crew placed 117th on the seedings stage but they struck brake trouble on the Heywood special stage losing an hour and then heading straight for Adelaide, missing 14 controls. Their progress through SA is not recorded but they apparently retired somewhere on the Nullarbor with unspecified problems. The big Falcon placed 106th on the seeding stage then had a solid run through to Adelaide. Despite losing almost an hour in the Bordertown bog they missed no controls (but skipped a passage) and were placed 63rd. 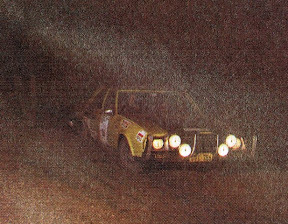 Problems on the first Flinders Ranges stage saw them skip a control and after Broken Hill they headed straight for the Nullarbor Roahhouse. They only did one more trial stage then headed into Perth with 16 controls missed for the division. They had a good run as far as Newman but then skipped to Shay Gap and completed to the remainder of the division into Darwin with 5 more controls missed. Apart from skipping the Roper Bar stage they completed the remainder of the division to Townsville with only 1 control missed. They had problems south of Mackay skipping those stages and basically followed the highway from Brisbane to Sydney missing 11 controls for the division. On the final disivison they skipped from Canberra to Mitta Mitta but were classified 61st overall with 40 controls missed. 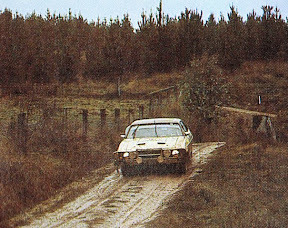 The big Charger was slow on the seeding stage (136th) and then they faced boggy conditions on the stages north from Mt Gambier, losing lots of time and taking a maximum on the Bordertown bog. They skipped the Sunset Country but made it to Adelaide with inly one control missed. 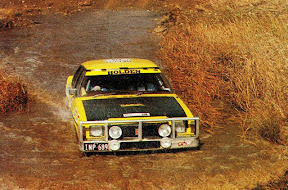 They struck problems on the first FLinders Ranges stage and lost two and half hours then short cut to Broken Hill, did the stages to Blinman and short cut to Kingoonya. They lost over an hour in the sand to Immarna and then over 4 hours on the rocks to Nullarbor Roadhousefrom where they headed to Perth with 14 controls missed for the division. In WA they skipped the stages between Meekatharra and Newman, also the Nunyerry stage and the Kimberley but made it to Darwin with only 5 more controls missed. However they then skipped the netire division to Townsville missing 19 controls. After doing the stages south to Rockhampton they basically followed the highway to Sydney missing 13 more controls but appeared to do most of the final division, just missing 2 controls. They finished 68th with 54 controls missed. The Torana crew placed 91st on the seeding stage and despite significant time loss north of Mt Gambier, they were up to 74th by Renmark. However they then struck trouble and had to cut to Adelaide missing 3 controls. They departed Adelaide 2 hours late and skipped the first trial stage but struck more troubles in Broken Hill. They eventually reached Perth missing 20 controls. They had a better run after Perth but skipped the stages from Meekatharra to Newman and the stage after Port Hedland but reached Darwin with inly 3 more controls missed. They followed the highway to Townsville doing no competition and missing 16 controls. A better run down the ast coast but they skipped from Dorrigo to Sydney missing 3 more controls and then completed the entire final division in 38th place. They finished 63rd with 44 controls missed. The official entry of the Hutt River Province, the old FJ placed 145th on the seeding stage. From Mt Gambier they skipped the stages to Renmark but picked up a few controls and reached Adelaide with 5 controls missed. After losing almost an hour on the first Flinders Ranges stage they ultimately headed for Perth missing 23 controls. They similarlyl followed the highway to Darwin missing 16 controls and the highway to Townsville missing 17 more controls. They did the Rockhampton and Brisbane special stages but otherwise followed the highway to Sydney missing 15 more controls. They skipped the entire final division but were placed 91st with 91 controls missed. After placing 132nd on the seeding stage the 240K had a reasonable run until losing nearly 2 hours on the Tarpeena stage. They then skipped the Sunset COuntry and also the Kuitpo stage before reaching Adelaide with 3 controls missed. With almost an hour lost on the first Flinders Ranges stage they then short cut to Kingoonya but lost almost 2 hours in the sand to Immarna and then never made it to the Nullarabor Roadhouse within late time. They scurried to Perth with 19 controls missed for the division. They followed the highway to Darwin missing 16 controls and likewise to Townsville missing 17 more. They had a better run down to Brisbane but then followed the highway to Sydney missing 11 more controls. They did much of the last division but appeared to short cut from Mitta Mitta to Albury. They were placed 81st with 70 controls missed. 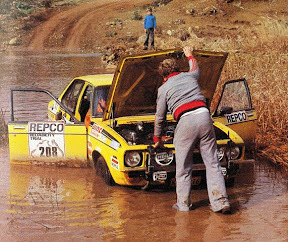 With more than half an hour lost on the seeding stage, they placed 150th, then struck problems on the short boggy stage after Mt Gambier. They short cut to Renmark and also skipped the Kuitpo special stage, missing 5 controls by Adelaide. Their problems must have been considerable as once they left Adelaide they went straight to the Nullarbor Roadhouse, did one stage and headed for Perth with 22 more controls missed. They followed the highway to Darwin, missing 20 controls then followed the highway to Townsville missing 19 more. On the run south they struck trouble at Mackay and skipped the stages to Rockhampton and basically followed the highway from Brisbane to Sydney, missing 10 more controls for the division. On the final division they only did the Canberra and Beechworth special stages but were placed 90th overall with 87 controls missed. The Mini Moke crew struck trouble on the seeding stage, losing almost an hour. After effecting repairs they headed for Adelaide but picked up the Kuitpo special stage enroute. With 16 controls missed it is unclear whether they started the next division or not. No further details were recorded. 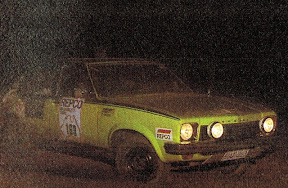 After placing 82nd on the seeding stage the Queensland Celica crew had a reasonable run as far as the Bordertown bog where they lost almost an hour but persevered to Renmark from where they cut to Adelaide missing 4 controls. 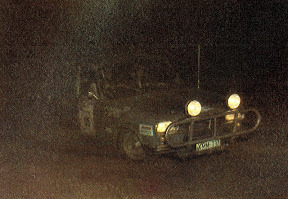 They appeared to have trouble on the first Flinders Ranges stage and eventually cut from Yunta to Nullarbor Roadhouse. They then did most of the route to Perth dropping 14 controls for the division. Trouble at Geraldton saw them skip the subsequent Rabbit Run stage then they skipped most of the stages from Wittenoom to Derby dropping 8 controls for the division into Darwin. They appeared to do little competition on the run to Townsville where they missed 16 more controls. 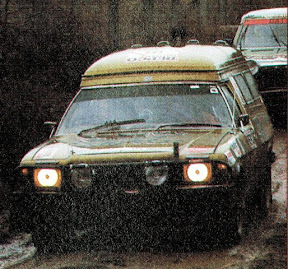 They picked up a selection of stages on the run south to Sydney but missed 9 more controls. They skipped the entire final disivisoon missing 15 more controls making a total of 65 controls missed placing them 79th outright. 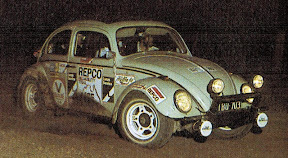 The VW crew placed 128th on the seeding stage then lost considerable time on the stages north of Mt Gambier, including almost 2 hours on the Bordertown bog. They skipped the Sunset Country and headed for Adelaide with 4 controls missed. A late departure from Adelaide saw them skip to Yunta, do 2 stages then cut from Broken Hill to Nullarbor Roadhouse. They then did the stages to Coolgardie but had to cut to Perth missing 15 controls for the division. In WA they skipped everything from Geraldton to Derby missing 15 more controls into Darwin. They then followed the higway to Townsville missing another 15 controls, then the highway south through Brisbane to Sydney missing 19 more controls. They skipped the final division making a total of 78 controls missed and placing 86th outright. 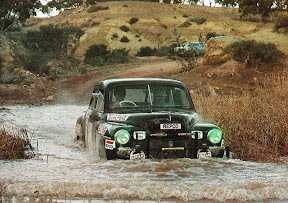 After placing 124th on the seeding stage, the Citroen crew had a reasonable run as far as the Bordertown bog where they lost almost 2 hours. They then skipped the remaining competitive stage to Adelaide missing 4 controls. 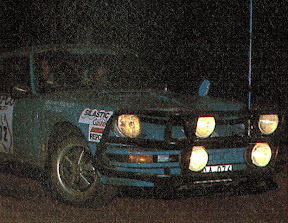 They departed Adelaide more than an hour late then lost a lot of time on the stages to Broken Hill from where they headed to the Nullarbor Roadhouse. They then did the two stages to Kalgoorlie where they apparently retired with unspecified problems. After placing 67th on the seeding stage, the HR crew lost a lot of time in the mud north of Mt Gambier. They eventually cut and ran from Bordertown to Renmark and on to Adeliade dropping 7 controls. 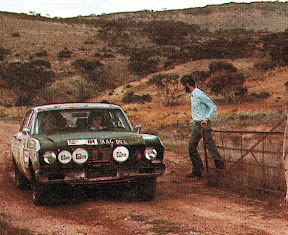 Despite losing about an hour on each of the big Flinders Ranges stages, they persevered to Blinman then cut to Nullarbor Roadhouse, did one stage and went to Perthy, missing 13 controls for the division. A later departure from Perth followed by more hefty losses saw them stick to the highway from Meekatharra to Darwin missing 10 more controls. They did the stages to Borroloola but then highwayed to Townsville missing 13 more controls. They followed the route to Rockhampton but then stuck to the highway through Brisbane down to Sydney missing 15 more controls. Thy did the entire final division, placing 31st and were placed 73rd overall with 58 controls missed. Problems on the seeding stage saw them lose an hour and a half after which they headed for Adelaide picking up a few controls along the way. Their problems continued with a highway run to Pert and 24 more controls missed. They similarly took the highway to Darwin (19 more controls missed) and then to Mt Isa where they appeared to do their first competitive stage since Tooborac! They also did the Norma River stage to Croydon with over 2 hours lost and then headed for Townsville with 14 more controls missed. On the run south they did the Brisbane special stage but missed the rest dropping 15 more controls then skipped the final division. They were classified 89th with 87 (or perhaps 100) controls missed. After placing 83rd on the seeding stage this mid-north SA crew had a reasonable run through to Kuitpo where they struck problems losing over an hour. 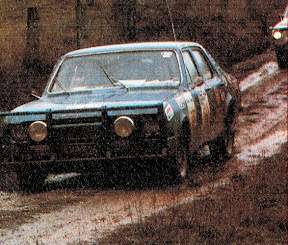 Nevertheless, they placed 60th into Adelaide with no controls missed. Their resonable run continued through to Immarna where they were up to 44th outiright despite losing almost 2 hours in the sand. However they did not make it to Nullarbour Roadhouse within late time, probably due to punctures. They cut to Perth missing 12 controls. They appeared to mostly follow the highway to Darwin but may have done a stage after Newman, but missing 15 controls for the division. They apparently retired somewhere after Darwin with a broken oil pump. The entire Fullager family were on a big adventure but perhaps didn't know what they were getting themselves into! After placing 144th on the seeding stage they had large time losses north of Mt Gambier and a maximum on the Bordertown bog after which they cut to Adelaide missing 6 controls. 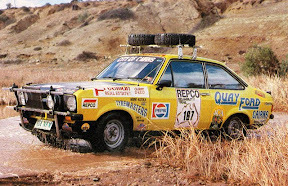 They lost more than an hour on the first Flinders Ranges stage then cut from Broken Hill to Kingoonya, only to lose 3 hours in the sand to Immarna and to never reach Nullarbor Roadhouse. They headed for Perth missing 19 controls for the division. They rejoined at Geraldton, lost over 3 hours on the Rabbit Run stage then headed for Darwin missing 17 more controls. They did the first stage out of Darwin but then headed for Townsville missing 17 more controls. They followed the route to Brisbane but then kept to the highway, just picking up the stage south of Grafton. They dropped 7 more controls into Sydney then skipped from Canberra to Albury, but were classified as finishing 85th with 72 controls missed. After placing 139th on the seeding stage, some large time losses in the mud north of Mt Gambier ended with a maximum on the Bordertown bog. They skipped the Sunset Country and lost an hour enroute to Murray Bridge, but reached Adelaide with only 1 control missed. 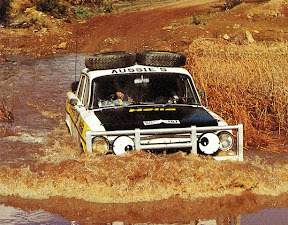 With about an hour lost on each trial stage after Adelaide they would have been close to their late time limit by Blinman, from where they headed for Perth, picking up a few controls on the way but missing 15 for the division. On the run to Darwin it looks like they only did the stage after Newman, but they visisted quite few other controls to miss 9 for the division. After Darwin they skipped the Roper Bar stage and later skipped the Norman River stage, then highwayed from Cairns to Townsville, but only missed 3 controls for the division. They skipped straigh to Mackay then did the route to the Gold Coast, did the stage south of Grafton then headed into Sydney with 6 more controls missed. They missed a further 4 controls on the final division where they supposedly short cut from Canberra to Buchan. They placed 55th with 36 controls missed. 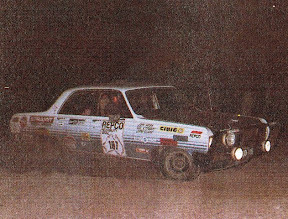 The old Dodge placed 141st on the seeding stage but short cut much of the route as far as Renmark. They followed the route to Adelaide but lost almost 2 hours enroute to Murray Bridge amd missed a total of 8 controls for the division. Their progress through SA is not recorded but they reportedly retired before Perth with a broken timing chain. 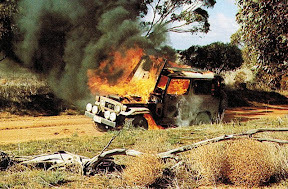 The modified (for 2WD) Landcruiser came to an unfortunate demise on the first division when it caught fire somewhere near Pinnaroo. The photo suggests that this may have been on the way into the Sunset Country stage. 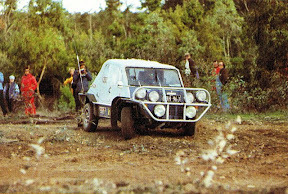 After placing 146th on the seeding stage the two man crew in the FJ soon struck trouble in the mud north of Mt Gambier, taking a maximum on the Bordertown bog and missing 2 controls before Renmark and 3 more on the run into Adelaide. 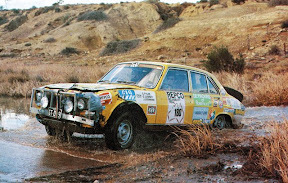 With almost 2 hours lost on the first Flinders Ranges stage they headed for Broken Hill to carry out repairs then pretty much followed the highway to Perth, missing 19 controls. After reaching Geraldton they highwayed to Derby and did the Kimberley stage, but missed 13 more controls into Darwin. They did no competition on the division to Townsville missing 18 controls, although reportedly changed the engine in Mt Isa. Then after doing the first stage to Mackay they highwayed to Sydney missing a further 18 controls. On the final division they only did the Canberra stage but were classfied 84th overall with 73 controls missed. These guys apparently requested last car after being denied car 69! The were 105th on the seeding stage and had a remarkably good run to Adelaide where they were placed 51st. Despite some hefty losses on the run to Broken Hill, they held position an improved to 46th by Immarna even though they lost an hour and a half in the sand. 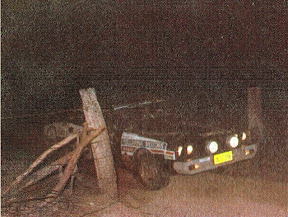 They managed to reach Nullarbor Roadhouse OK but lost 3 hours and were low on late time by Cocklebiddy and had to skip the Rawlinna stages. But they dropped only 2 controls into Perth effectively placing them 30th. Engine problems saw them leave Perth late but then the engine blew enroute to Geraldton. They did a rebuild in Moora then had to short cut to Port Hedland missing 15 controls, but they then completed the route to Darwin. They did the entire route to Townsville, placing 22nd on the division. Despite over an hour lost near Dorrigo, they also did the entire route to Sydney placing 36th on the division. They placed 33rd on the final division and 34th outright with 18 (or 17?) controls missed. You have spelt the entrant's names incorrectly. They are both my in-laws. Cheers Shaun. I've fixed that! Ian. Car 166, the Eric Stanley entry retired due to engine trouble, reportedly caused by removal of a shroud. I knew Eric and Barry Burr. I did the passage control at Calliope, west of Gladstone. Q. I still have one of the signs. There was an error in the route instructions and I had to tell each team that the Kalpowar turnoff was another 70km further. I don't think some of them really took it in.